This subsidiary print of a couple observed by a youg girl is inspired by Boucher's engraving of Autumn after Watteau. It is also found on enamels and Worcester porcelain. 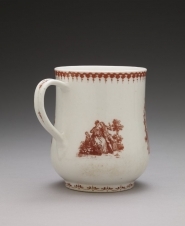 This Bow mug is printed in red enamel with a scene known as The Letter, showing a gentleman and a lady in conversation. He points to a letter that he is holding. The rim of the mug has a painted loop and trefoil border. The foot rim is painted with an arabesque border.